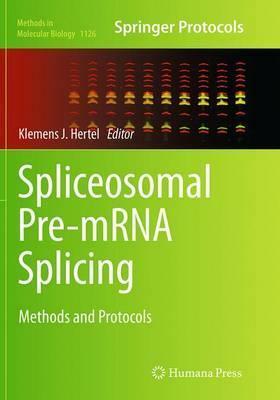 Providing a guide to classical experimental approaches to decipher splicing mechanisms and experimental strategies that rely on novel multi-disciplinary approaches, Spliceosomal Pre-mRNA Splicing: Methods and Protocols describes the theory of alternative pre-mRNA splicing in seven introductory chapters and then introduces protocols and their theoretical background relevant for a variety of experimental research. These protocol chapters cover basic methods to detect splicing events, analyses of alternative pre-mRNA splicing in vitro and in vivo manipulation of splicing events and high-throughput and bioinformatic analyses of alternative splicing. Written in the highly successful Methods in Molecular Biology series format, chapters include introductions to their respective topics, lists of the necessary materials and reagents, step-by-step, readily reproducible protocols and tips on troubleshooting and avoiding known pitfalls.Comprehensive and practical, Spliceosomal Pre-mRNA Splicing: Methods and Protocols will aid newcomers and seasoned molecular biologists in understanding the fascinating world of alternative splicing with the ultimate goal of paving the way for many new discoveries to come.